In early 2006, I told Jineen (my best friend, and Windchase manager and trainer) that I thought we were due for a really neat vacation at the end of the year, and that I had enough frequent flier miles for two business class tickets anywhere in the world. We just had to decide where to go! There were many options, and plenty of places that we would like to see. But since the trip was to be in December, we wanted to choose someplace where it would be warm. Scotland , Alaska , the Canadian Rockies; these would definitely have to wait for a summer visit. Jineen and I have developed a style of travel when we vacation together that we really enjoy. We like to rent a car and drive, without an itinerary or any advance lodging - just follow our noses, explore the countryside, and see where we end up each night. Of course, you can�t do this everywhere; in some parts of the world it wouldn�t be safe, so our desire for a �footloose and fancy free� vacation ruled out some of the other destinations on our list. But New Zealand lends itself perfectly to this type of travel. Jineen and I had spent two weeks there in 2004, and we had absolutely loved it. So after much consideration we made our choice: we were returning to New Zealand . At last we were off. After months of anticipation, a busy Event Season, and then a hectic week of clinics at the farm leaving no time for preparation or packing, it seemed strange to finally be on our way. I had read an article that said in order to avoid jetlag on the long flight to NZ it was best not to sleep much the night before, so that you would be tired and could fall asleep on the plane. In this regard, after being up until 2:30 a.m. packing, I was well prepared. But on the other hand, since for once in my life I had saved up enough frequent flier miles to get Business Class tickets, I wasn�t completely sure I wanted to sleep too much on the plane; I wanted to enjoy it. As we took the first leg of the trip, the United Flight to San Francisco , we decided that it was really nice to be up in the front of the plane, with roomy seats and padded armrests, and not have to rub elbows and hips with some smelly fat guy in the seat beside you. They brought us drinks before take-off, the meals were edible, and we even had a tablecloth. We decided that we could really get used to going Business Class. We even started to get a little bit of an attitude about it � like we deserved to be up here rather than in the back of the plane with the huddled masses! After a few hours layover in San Francisco (we got to sit in the First Class lounge! ), we boarded our Air New Zealand flight to Auckland . We figured that on the bigger plane for the flight over the Pacific Ocean the Business Class seats would be even better, but nothing prepared us for the reality. As we were ushered to the very front of the plane, right up in the nose, we thought there must be some mistake � surely any minute they would send us back to economy. We didn�t have seats, we had our own compartments! It was unbelievable. They called it Business Premiere, but it could have been called Royalty. The seats were set diagonally at an angle along the side wall, so that each person had their own private little space that was almost like a small room. The seats were well padded and had automatic lumbar support, with controls to adjust it in four different directions. There was an ottoman in front of each one that was a comfortable footrest, but also doubled as a guest seat, complete with seatbelt, in case a friend wanted to visit. Underneath it was a space to store your shoes and personal items. In addition to reclining, at the push of a button the seats would convert to beds, complete with mattress pads, pillows and comforters. And of course, we were told, our flight attendants would be happy to assist us in preparing our beds. The seatbelts were padded, and also had airbags. I promise I am not making this up! Each �passenger area� had numerous other features. There was a table for meals, of course adjustable in position, which popped out of the cabinet at the touch of a remote control button. There was a video screen, totally adjustable to any position or angle, with a choice of over 50 movies and television shows to be played at our convenience; it could also be used for video games. It had a remote control, which was also a telephone. The headset for the audio was deluxe and padded, and totally blocked out all background noise. Each seat had its own power socket, with 110v and 60Hz, which would accept connector plugs from around the world. There was a cocktail tray (very useful, as the flight attendants were constantly bringing us drinks), a water bottle holder (complete with a bottle of water, of course), a headset pocket, a magazine pocket, and a retractable armrest. The reading light was on a swivel so that you could adjust its angle and position, and there was a second reading light to the rear, for use in the bed position. There was an additional overhead light with a remote control. In fact, there were so many complicated features that there was a pamphlet with instructions on how to work them all. Of course, in addition to the fabulous seating area, the service was superb. There were snacks, a choice of wines, meals that were not only edible buy actually quite good, and friendly Flight Attendants at our beck and call. As we sipped our pre-flight champagne and looked around, we tried to act very suave and sophisticated, and give the impression that we had flown like this before. But I fear our civilized act was marred by me pulling out my camera and snapping photos while making exclamations of amazement over our surroundings. But we did notice that most of the other passengers were doing the same. We decided that it didn�t matter if we stopped in NZ or not; maybe we would just stay on the plane and enjoy riding back and forth across the Pacific in style. Air New Zealand is definitely my new favorite airline. We arrived in Auckland , on the North Island , early in the morning. We had to collect our baggage and go through customs and immigration, and we found the baggage area well patrolled by officers with dogs. Were they checking for explosives? For smuggled drugs? No, for something much more sinister: they brought out the fruit-sniffing beagles! In New Zealand they are very strict about not bringing any food, plants, or other biological matter into the country, to avoid contamination. Thank goodness I remembered at the last minute to get rid of the apple I had put in my bag in San Francisco . But I did get my hiking boots cleaned for me. You have to fill out that immigration form on the plane that asks if you have been on a farm or around animals, and if the answer is yes they inspect your luggage pretty thoroughly. The inspector noticed a little mud in the treads of my hiking boots (a few remnants of the Appalachian Trail ), so he grabbed them and said, �Back in a jiffy.� When he returned with my boots, they were spotless. We took a commuter flight to Christchurch , on the South Island . On our New Zealand trip in 2004, we had visited both islands, but this time we were going to travel only on the South Island , which has fewer people and more wilderness. We collected our rental car, a four-wheel-drive Honda CRV, from the Rent-a-Dent company; the name doesn�t exactly inspire confidence, but the car turned out to be excellent. Besides, with the roads we planned to drive down, we didn�t want a brand new rental car with a fresh paint job. I figured I had gotten by my first big hurdle; I had entered the country and rented a car without being arrested for that unpaid speeding ticket from 2004. We set out from the airport at around 8:00 a.m., having slept enough on the flight to feel well rested and eager to explore. We left Christchurch (midway on the east coast of the South Island ) and headed north for Kaikoura. 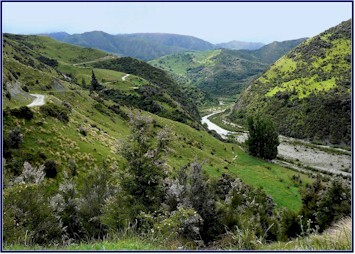 But instead of taking the direct route up the coast, we turned west at Waipara and took the inland road, following the �Alpine Pacific Triangle� route, crossing the mountains at Weka Pass and continuing past the town of Waiau. (As some of these place names reflect, the language of the Maori, the indigenous people of New Zealand , only has 14 letters, and most of them seem to be vowels.) We stopped in the town of Amberly for a coke (caffeine needed!) and an apple turnover, then continued on the scenic route. We passed through beautiful mountainous countryside and pastoral farmland. There were sheep. Fields and fields of sheep. New Zealand is home to less than 3.5 million people but over 70 million sheep, and a high number of them seemed to live in this area. There were also pastures of cows, red deer , wapiti (elk), and even ostriches. We saw magpies everywhere, in their vivid black and white plumage, and falcons were soaring on the wind above us. We crossed the Conway River , notable because that is Jineen�s maiden name. This was the first of the �braided rivers� we came across on our trip, with its multiple interweaving channels criss-crossing through the broad rocky flats. We saw an abundance of evergreen trees, somewhat like cedars, but covered with tiny white blossoms, making it look like the trees were covered in frost. This is one of the fascinating things about NZ; all of the trees are very different from ours. As we drove along we came across a farmer moving his sheep, with the help of three sheepdogs. We stopped to watch; they were amazing. The dogs herded the sheep into a tight circle, and kept them moving around it like a whirlpool. When the farmer gave them the signal, they moved the whole �mob� (NZ for a group of sheep) through a gate and down the road to another pasture. We stopped in Kaikoura for happy hour provisions (more on this later), then headed north along the coast toward the tiny town of Kekerengu . I had booked a room there in advance, so that we wouldn�t have to worry about finding lodging on our first evening in NZ. After that nothing was pre-arranged, we would do it day to day; wanderlust, and all that. We followed the shore road, with the Pacific on our right hand and the Kaikoura Mountain Range on our left. We stopped near Ohau and took a short walk to a secluded waterfall. It was a very pretty and peaceful spot, surrounded by forest. A sign told us that at certain times of the year seal pups play in the pool below the falls. Presently we went back out to the road and continued up the coast, keeping a close eye on the shoreline. Sure enough, soon we saw seals, sunning themselves on the rocks. 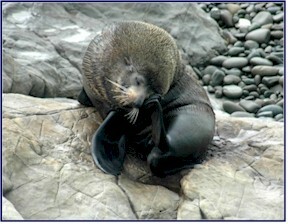 They were New Zealand Fur Seals; we had seen some on our previous trip. 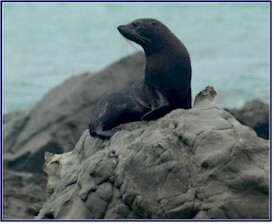 We watched them as they lounged on the rocks, occasionally going for a swim in the rough surf. They were comfortable with us observing them from a distance, but got nervous if we approached too closely. But I was able to get close enough for some good photos! We decided from the start that the theme of our trip would be �the road less traveled.� We had a very detailed driver�s atlas map book, in which the types of roads are represented by different colored lines. The motorways are drawn in thick green lines, but as far as we could tell from our maps, there is only one section of motorway on the whole South Island , and it stretches for less than 15 kilometers. The major roads are indicated by a bold red line. The secondary roads are marked by a medium red line � although these can be very small and winding. 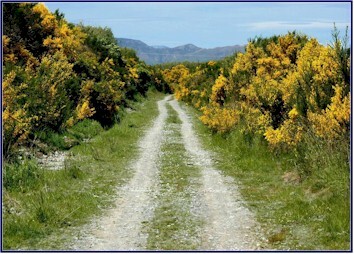 The minor sealed (NZ for paved) roads are shown as a narrow red line; these small byways are very rural, with few cars. The least traveled roads are marked in yellow; the unsealed (gravel or dirt) roads show up on the map as a thin yellow line, and the four-wheel drive vehicle tracks are indicated by a dotted line. We like to take these �yellow roads� whenever we can. We turned onto Waipapa Road , a gravel lane that winds along the top of the Clarence River Valley before dropping down to run alongside the watercourse. 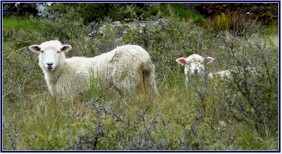 There were huge sheep stations (NZ for farms or ranches) along the river. We followed the narrow lane as it got smaller and smaller, enjoying the peaceful beauty of the evening. Eventually the road ended at a private farm, right up at the far end of the valley, so we turned around and headed back to the main highway. We came to the Coastal Lodge, a nice B&B with a view of the ocean. We had dinner across the street, and then went for a short drive up the back road behind the B&B, at the suggestion of our hosts, Anne and Grant. We were starting to feel quite tired and jetlagged by now, but it was too beautiful an evening not to see just a little more. The lane climbed to the top of a long hill, where we could look back over the ocean. We passed farms with cows and horses, and fields full of the cedar-like trees with their white blossoms making them look like they were covered in snow. 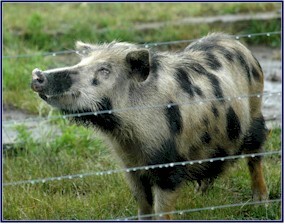 We went by a field with a half a dozen pigs in it, and when we slowed down for a look they chased us. They followed the car, determinedly running after us inside the fence, and when we stopped they stood looking at us expectantly, obviously hoping for food. The huge male, who must have weighed 500 pounds, looked especially hungry; he was drooling and chasing away the smaller pigs. We couldn�t imagine who drove by and stopped to feed them often enough that they would expect handouts from random passing cars, but evidently someone had given them a sense of anticipation and hope. A mystery! Because NZ is so far south, the days were very long this time of year; it stayed light until after ten o�clock. By now we were very tired and ready for bed, so we went back to our B&B, and were practically asleep before our heads hit the pillows. We woke up early, around 5:30; our bodies confused by the 18 hour time difference. But we had gotten a good night�s sleep, and we felt well rested and ready to go. I stood for a while out on the deck and watched the expanding sunrise over the Pacific, listening to the sound of the surf and the bellbirds. We chatted with Anne and Grant over breakfast. We found out who had been feeding the pigs � it was Anne! 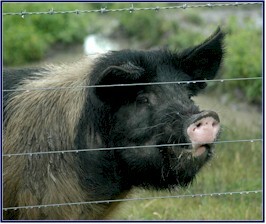 She told us that she regularly goes for an evening walk up the road, and takes her table scraps to the pigs. 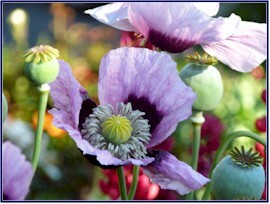 Anne asked us, �Pline or green breed?� I was totally mystified. After several repetitions, we finally realized that she was asking if we wanted plain or grain bread for our breakfast toast. Little did we know at that point that soon we would be wishing we had eaten no bread at all. We took one last drive down the back road to say goodbye to the pigs, and then headed back down the coast towards Kaikoura. We paused to visit the seals that live along the rocky shore at Ohau Point, and to photograph red deer in a paddock near the road, with their amazing antlers. We saw a rainbow over the Clarence River ; surely a sign of good luck. The NZ Highway Department puts out signs with clever slogans and graphic pictures to encourage people to drive safer. We passed one with concentric rings like a target, with 100 in the middle. It said, �It�s not a target � drive to the conditions.� (The 100 stands for 100 kilometers per hour, the speed limit on most roads in NZ.) I was doubly motivated to obey the law, with my 2004 unpaid speeding ticket in mind. Crossing over a small water runoff, we noticed a sign for �Snoutfield Culvert�. We had noticed along the way that they seemed to name their culverts; this one appeared to be named after our pig! We came to Kaikoura to look for whales. This was the one activity we had planned for this trip which we had done on our previous visit. Or had at least tried to. The town of Kaikoura is famous for its Whalewatch, run by the Maori people, where you can go out on a boat and see whales. 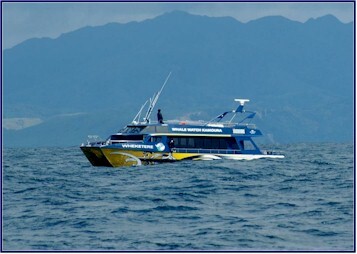 When Jineen and I took our NZ trip in 2004 we went out on Whalewatch, but the seas were too rough and the trip was cancelled. We wanted to give it another try. At first everything seemed fine. When we had come on the previous trip, we were given dire seasickness warnings and basically told that anyone who was predisposed to motion sickness, or was elderly, handicapped, young, pregnant, whiny, wimpy or basically faint of heart should get off the boat before it left the dock. And yet we hadn�t gotten seasick. Granted, we weren�t out very long that time, as the waves got so big that the captain soon turned the boat around; but nonetheless we hadn�t lost our cookies on that trip, so with good sea conditions we thought this one should be a breeze. We took two Dramamine just in case, and figured we were good to go. By the time we were near the area where the whales are sighted, we were felling a bit green around the gills. By the time we found the first whale we were downright sick. It wasn�t too bad when the boat was moving. It zoomed along, leaping the waves in a rhythmic motion, and we were able to adapt to that fairly well. They put educational information about whales on the video monitor, but it was kind of hard to watch that while keeping your eyes on the horizon. But when the boat would stop to use the sonar listening devices to locate the whales, well, that is when things would get dicey. The boat would rock back and forth and Back and Forth and BACK and FORTH AND . . . well, you get the idea. Then everyone would fall over each other to get to the outside deck for fresh air, about which time the captain would call us all back inside so the boat could move to a new location. We felt sicker and sicker, and clutched the motion sickness bags tighter, and breakfast was an evil memory. 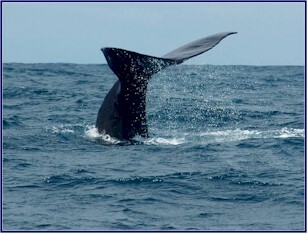 In the end, we were able to get quite close to two different whales, and we watched them dive. The first was one our guides identified as Saddleback (they often see the same whales, and give them nicknames, identifying them by the scars on their backs and the ridges on their tails), and the second one was known as Little Nick. 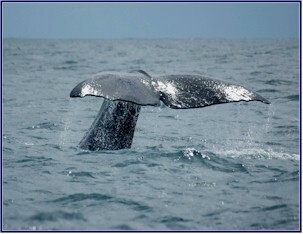 They were sperm whales, which can grow up to seventy feet long, and dive as deep as 1200 feet. It was awesome to see them and watch them dive, their great tails flipping majestically in the air before disappearing into the deep blue waters. Too bad we couldn�t enjoy it more! Even though I was feeling quite sick, when we sighted the whales I was able to go out to the rail to take some photos. Jineen, on the other hand, had to make a choice; take pictures or hold on to the barf bag? Hmmm, tough decision. After returning from Whalewatch, we walked around the shops in town for a while until our stomachs settled, and then we headed north on the coast road. We had heard about a hike to Sawcut Gorge, a track that follows a river up through a narrow canyon where the cliffs are high on either side. The people at our B&B had given us directions; they told us that the turnoff was marked by a bicycle on top of a water tank, and to follow that road all the way to the end. We found this unusual landmark and turned up a small (yellow) road that followed the river deeper and deeper into the valley. We passed a vineyard, and went by a number of sheep and cattle stations. The road got smaller and narrower, looking less and less traveled the further we went; it had grass growing along the middle of it. We crossed several open fords with the water well up on our hubcaps, and three times had to stop and open livestock gates. We went up and down some extremely steep hills, and passed a high waterfall where a small stream issued forth over a cliff. The countryside was very remote, and very picturesque. After about ten miles on this little byway, we finally came to the end, at a farm called �Isolation.� It was aptly named. I sometimes joke about one day running away from home to become a hermit; if I ever was to do it, this is the sort of place where I would want to live. It was wild and secluded and beautiful, and we hadn�t seen a soul for miles. We were greeted by the owner of the farm; he was quite a character. Amid much teasing about our navigating skills, he showed us the way to the trailhead. He also rather gleefully told us that the hike to Sawcut Gorge, which was, appropriately enough, on Isolation Creek, would involve not only following the stream but also repeatedly wading in it well up over our knees. He told us not to worry, if our car was still parked here in a couple of days he would send someone out to look for us! As it was quite late in the afternoon and had turned cloudy and cold, we decided to forego the hike and leave Sawcut Gorge for another time. Returning to the coast road, we headed up to Blenheim, well known as wine country; we saw more and more vineyards along the way. New Zealand is known for producing some excellent white wines; we had sampled quite a few of them on our previous trip. Our favorite was the Cloudy Bay Sauvignon Blanc; that vineyard is quite well known and considered world class. We were ready for happy hour � we just needed to find the right spot. Jineen and I have refined the art of happy hour on numerous trips together. We get a bottle of wine and some food, find a really beautiful spot, and have a little picnic. Sometimes we have it before dinner and sometimes after, and often, like on this evening, it is dinner. We pulled out the map book and found a tiny road that went right down to the shore of Cloudy Bay. We parked the car overlooking the water and dined on fresh bakery bread, cheese, crackers and chutney. We sipped our wine (glasses supplied by Air New Zealand ); we had splurged and bought a bottle of our favorite. Drinking Cloudy Bay Sauvignon Blanc at Cloudy Bay - it couldn�t get much better than this. From our happy hour spot, there was a staircase that went up the side of a large rock outcropping. We climbed it and followed the path that continued on from there. It climbed up a steep knoll and then down the other side into a small sheltered cove called Monkey Bay . It was a U-shaped crescent of beach, surrounded by tall cliffs, with caves carved out by the waves. We explored the shallow caves and listened to the surf pounding into the rocks and hollows. We checked into our B&B for the night, the Olde Mill House in Blenheim. It had lovely flower gardens out front, and a huge tree, very beautiful and unique, with its spreading branches dominating the yard. We were happy to hit the hay; once again we were quite tired by the end of the day, not being totally adjusted to NZ time yet. At home, it was now six hours later, but yesterday!